M.A.C.E. 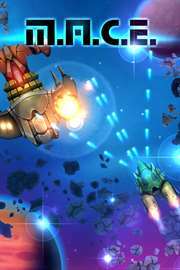 is a classic 2D space shooter, shoot’em up or shmup inspired by Amiga games, as the dev says. Developed by German studio EntwicklerX and released in 2017 for PCs, the game now comes to Xbox One with its colorful hand drawn graphics and addicting gameplay that shall keep you engaged for its 3 worlds and 18 challenging levels. Are you ready for the task? To your spacecraft, pilot! Prepare your weapons, fully equip your ship and embark on this journey throughout the galaxy! The gameplay is the aspect of M.A.C.E. that shines the most. The game is a shoot-em-up with vertical scroll where you control your ship with the left analog stick, shoot with A, use your bombs with B and cycle between weapons with LB and RB buttons. There’re power-ups (homing missiles, shields, health and lives), new weapons and upgrades hidden in stages. Controls are precise and, as the game rhythm isn’t very intense (at least on the beginning), even those who don’t perform very well in games of the gender (me included!) can have lots of fun with it. The game can be played in local coop, what makes things much easier, except for the fact that you and your wingman share the same amount of lives. Better be assured you can count on your partner before inviting him/her to the game. The progression system of the game is quite interesting. Each one of your eight weapons can be upgraded in two levels, adding more firepower, rate of fire or range. Find the one that words best for you and try to upgrade it right away! Every time your ship is destroyed, you miss one of your power-ups (the companions, the homing missile) or one level of your guns, so always remember to be careful while flying out there. A.C.E. supports the use of 3D glasses (for TVs with that technology). Something quite unusual nowadays. Unfortunately, I was unable to try this feature this time. If your TV does support it, please, let us know how it was. Your HUD, although useful, is over simplistic. It shows your score, how much health and the amount of lives your ship has left (what took me some time to figure it out what those bars meant) and the number of bombs you’re carrying. It also shows a progress bar where you can see how much you’ve progressed in this stage or how long it will take for you to reach the end of the it. On the bad side, it misses some visual elements, some more sophistication over its blue shade. Your special weapon, the bomb used with B button, lacks impact. It’s a very useful resource that helps you out of most problems, but it doesn’t have that visual impact you expect when using your last resource in this kind of game. Graphics, although hand-drawn, failed to impress me. Your ship and enemies (including the bosses) have little detail, what contrasts with backgrounds that are colorful and beautifully elaborated (especially World 3). The same can be said about explosions and visual effects: they could have much more bang! The soundtrack and mostly of the sound effects don’t leave a mark. You have all the ‘phews’ and ‘zaps’ you could expect, but I really miss some more impact on explosions (yes, they again). And please, don’t come with jokes saying sound doesn’t propagate on space: have you never watched Star Wars? Unfortunately, M.A.C.E. has no story at all. I understand shmups don’t need a reason to be, but I’d like to know who I am and who my enemy is in this game. The overall presentation of the game could use some improvements. From the loading screens to the menus, the visuals are poor and disorganized (the menus, at least). C’mon, guys, I believe you can show something better. After beating its 18 stages divided in three worlds, all you can do is try the game again in a different difficult level. If not for that, there’s no purpose on playing it again. It’d be nice to see some replay value in this title. [Score: 62/100] M.A.C.E. is an interesting and funny shot’em up that you can enjoy for short bursts or in a longer play session to finish it in one sit. But that’s all. It has good gameplay elements and the controls make it easy even for those who aren’t good shmup players to enjoy its challenging levels, but it misses more finishing and replay value. However, its price tag makes a good opportunity to try something new and grab 1000G.